LongIsland.com - Your Name sent you Article details of "Spring Festivals, Hot Happenings, News & More in April 12th's Newsletter!" Find out more about the hottest fun coming to Long Island as we warm of with Spring Weather! Looking for somewhere to enjoy a great meal this weekend? Why not head over to Hudson's Mill of Massapequa for a night filled with moutwatering entrees, and pitch perfect cocktails. Their menu includes a wide variety of options ranging from savory seafood, to hearty pastas, and steaks that will leave you satisfied. They also have a relaxing bar area, where you can enjoy a glass of wine, cocktails, and beer options, which they have quite a variety of. This week has finally brought the Spring weather we've been waiting for to Long Island, and over the past few days, that has included some April showers as well. Luckily, it looks like the weekend will be warm and clear - perfect for anyone looking to enjoy the budding plants, and sunshine at the parks and outdoor activities and festivals happening across LI. If you're ready to enjoy Spring, then get out there and get to it, Long Island! Come Celebrate Jazz in Riverhead this Weekend! Treat your family to a rockin' good time at Rolling River’s Annual Rock-the-River Spring Festival & Fundraiser on Saturday, April 20 from 12:00-4:00PM (rain date Sunday, April 21). Sponsored by Local Luxuries and open to the entire community, this family-friendly spring festival features carnival rides, live entertainment, pony rides, an interactive vendor fair, playgrounds, tumbling center, music, face painting and more. All proceeds benefit The Campmates Program, Rolling River's scholarship fund which provides free camperships to local children. Free admission on to campgrounds, food and crafts available for purchase, ride tickets- $3 per ride ticket or $10 for an unlimited ride bracelet. Hosted at Rolling River Day Camp- 477 Ocean Avenue, East Rockaway/Oceanside. For more information, or to schedule an estimate, please visit their website, or call 516-593-2267. U.S. Sen. Charles E. Schumer, chair of the Hurricane Sandy Rebuilding Task Force, Monday called on the U.S. Dept. of Housing & Urban Development to reimburse over a dozen LI school districts for costs to transport displaced students in the wake of Hurricane Sandy. According to the McKinney Vento Assistance Act, districts must provide transportation to homeless or displaced students within a 50 mile radius of their district. But the cost of complying with the law is eating away at district budgets—combined, they have spent over $1 million to provide for the transportation needs of displaced students. 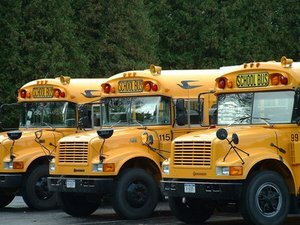 Schumer, who wants to ensure that the financial burden does not fall on taxpayers, is calling on the federal government to find a way to help reimburse the districts that have been providing ongoing transportation services to the approximately 1,000 students displaced by the storm. Kitchen Magic Presents $1500 Off Spring Savings! New Cabinetry or Cabinet Refacing with a Counter Top! For more information, or to schedule an estimate, please visit their website, or call 516-537-3577. If you’re looking for some good family fun this weekend, come on down to the Wantagh Park Family Festival happening Friday-Sunday, April 12-14th! Enjoy fun carnival rides, great food, and more at this kickoff to the spring season! The festival begins at 6PM on Friday and 12PM on Saturday and Sunday. Admission is free! Don’t miss out on a weekend of fun-filled family activities! What better way to start spring than with some shopping? Head down to Manhasset Park District Park for a weekend full of vendors and craft shopping! Happening Saturday and Sunday from 10AM-5PM, this event will feature dozens of vendors exhibiting handcrafted items, jewelry, accessories, clothing, home decor, any many more unique gift items! Come on down for some great shopping and support local business! If you love to gamble for a good cause, then head down to Bay Street Theatre for their Casino Night this Saturday, April 13th from 7-11PM! Tickets are $50 advance and $60 at the door and includes one free drink, free munchies at the bar and $200 in "Bay Street Bucks" to play your favorite games! There will also be raffle tickets and concessions for sale. All money will benefit Bay Street Theatre and the Sag Harbor Volunteer Ambulance Corp! Join hundreds of people and families affected by mesothelioma, a devastating cancer caused by asbestos exposure, this Sunday at the 8th Annual 5K Walk/Run for Hope from 9AM-12PM! Not only will there be the walk and run but also raffles, giveaways and a free t-shirt for all who participate! cost is $25 in advance and $30 day of the event. Help to one find a cure to this terrible disease and head down to Eisenhower Park for this wonderful event!